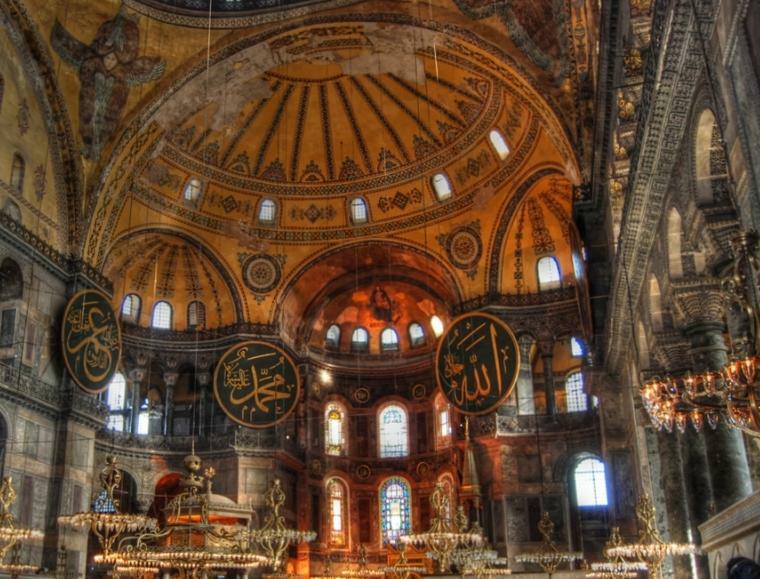 The first church on the site of Hagia Sophia was inaugurated in 360 CE during the reign of Constantius II. Historians continue to debate whether it was Constantius or the earlier emperor, Constantine the Great, who ordered the building of the church. Either way, the largely wooden structure burned down in 404. The church was rebuilt under Emperor Theodosius II in 405 and was to last a bit longer than its predecessor. It was also, however, destroyed by fire in 532. A few marble blocks remain from the structure and can be seen in the courtyard of the present building. The third incarnation is essentially the one that stands in today’s Istanbul. Justinian’s grand design was far beyond what had gone before, though astonishingly, the huge new church was completed within six years. The building has been damaged by a combination of earthquakes (a common event), fires and the ravages of the so-called Fourth Crusade, when Latin ‘Christians’ looted and ransacked their way through Constantinople. After the fall of Constantinople to the Ottomans, Hagia Sophia was converted into a mosque, which it remained until the founder of the present Turkish state, Mustafa Kemal Ataturk, decreed that it be turned into a museum. Other than the sheer size of the building, it’s probably the dome that takes the breath away. The dome was the world’s largest until the construction of St Peter’s Basilica in Rome, which is around ten metres bigger. The effect in Hagia Sophia is magnified by the windows around the dome, providing a huge amount of natural light into the building. You can spend a considerable amount of time simply staring in wonderment at the dome. It’s hard to imagine what the mosaics would have looked like before the various depredations of the Crusaders and the coverings that took place after the conversion to a mosque (where religious iconography is not permitted). Earthquakes have taken their toll as well, but there are still some impressive examples, notably above the Imperial Door and in the upper galleries. 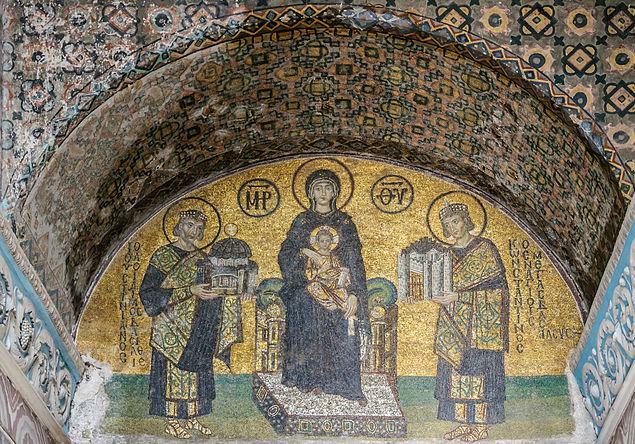 A little glimpse of the church’s origins can be seen in the mosaic depicting the Virgin Mary with the baby Jesus receiving gifts from the emperors Justinian and Constantine the Great. The mosaic is in the doorway above the south-western vestibule. 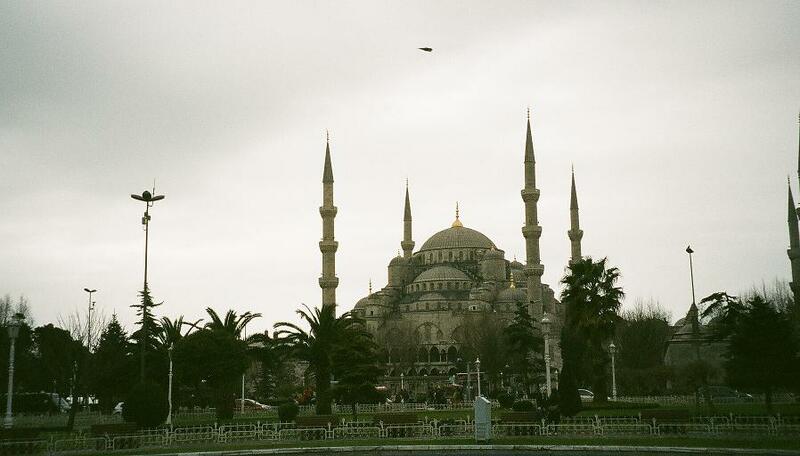 A look at the biggest mosques in Istanbul suggests that the Ottomans were as impressed as everyone else by Hagia Sophia. Just a glimpse of the mosques of Sultan Ahmed (popularly known as the Blue Mosque), Süleymaniye and Rüstem Pasha calls Justinian’s great cathedral to mind. The resemblance is quite striking. Considering the events that Hagia Sophia has witnessed over more than 1500 years, its condition is remarkable. The building requires almost constant maintenance, but the cost of losing such a wonderful structure cannot be quantified. One of the supreme ironies, of course, is that the great seat of the Eastern Christian Church was treated with a great deal more respect by its Muslim curators than it was by the Crusaders who hypocritically travelled under the Cross. For that, we should all be grateful. This entry was tagged Constantinople, Hagia Sophia, Istanbul. Bookmark the permalink.